The Arab Israeli conflict could have been avoided had the Arabs dealt honorably with the situation. The greatest part of the problem is the Arab refusal to assist and eventually absorb the refugees they made. While there are actually two distinct and separate groups of refugees, they both originate from the same side, the Arab nations. There are the almost one-million refugees the Arab world created largely during the 1950’s as they expelled, deported, threatened and otherwise demeaned their Jewish populations forcing almost all to depart often with merely a suitcase or just the clothes on their backs. These refugees had their property stolen and gifted to Arabs the ruler favored, had their businesses destroyed, their bank accounts seized and anything of value taken from their baggage as it was inspected before allowing them to board the boat or plane which would take them to Israel. Then there were the six-hundred-thousand Arabs who heeded the call by the Mufti of Jerusalem to vacate their homes and wait behind the Arab lines while their armies decimated Israel killing everyone they encountered. They were promised a share in the Jewish wealth which would be the great bounty the conquering Arabs would find once they had defeated these Jewish upstarts trying to make a nation for Jews. Something went terribly wrong for the Arabs as they never quite succeeded in the realization of the Mufti’s dreams. These Arab nations, primarily Lebanon, Syria and Jordan; had the hundreds of thousands of homeless Arabs who had left their homes in Israel believing the Arabs would easily win the war of annihilation they planned for Israel and her Jews. When the war ended with the Arabs having gained control of Gaza and parts of Judea and Samaria, the Arabs had to figure out what to do with these refugees. They could have allowed them to return to Israel which the Israelis would have permitted early in the 1950’s or they could have absorbed them back into their countries which was where many of them had lived before moving to Israel due to economic factors providing better opportunities for employment. But the Arabs chose a third alternative, they locked their brothers and sisters into camps making the Arab refugee problem. Every other similar situation resulted in a population exchange, except this one. Allowing this refugee situation, it is not a problem as it was a direct result of intentional actions in order to make a bludgeon with which to pound Israel into submission, was the world’s means of backing the Arab desires to destroy Israel as most of Europe wished to be rid of a Jewish State forcing the Jews back to living completely vulnerable to the shifting moods of the surrounding populations. Allowing a Jewish state with a Jewish military was just too unsettling for many Europeans as they prefer their Jews defenseless. This has been the situation for over seventy years, but the argument has changed and names have been adopted in order to steal, bend, fold, spindle and mutilate actual history presenting a bastardized form which was self-serving the Arabist claims that Israel was an illegal entity deserving of destruction. The first alteration came in 1964 with the formation of the PLO by the Arab League in conjunction with the KGB which had trained Yasser Arafat and Mahmoud Abbas during the times each spent in Moscow. Yasser Arafat, was born and raised as an Egyptian in, of all places, Egypt, imagine that. He became the face of the Palestinian Arabs who were assuming the title as being Palestinians as previous to the formation of Israel, and even up to this point, anyone referred to as a Palestinian was a Jew and the Arabs were simply the Arabs. Now that they were calling themselves Palestinians, the next thing was to give the world a few years to become comfortable with the denotation of the Arabs as Palestinian and then they claimed that they were the Palestinians who were supposed to have the lands from the River to the Sea. Now they were claiming that they were the people under Roman rule when the region was renamed after the 135 AD Jewish revolt. But why stop there, which they did not. Over the years they have claimed that they were the Canaanites, the Philistines, the Phoenicians, that they have resided in the Holy Lands for over five thousand years thus were there before the Jews ever arrived, claimed that they invented the first Palestinian-Canaanite language and written alphabet five thousand years ago (a full two thousand years before cuneiform came to be which was credited with being the first written language). They have made other equally ludicrous claims such as Jesus was the first Palestinian murdered by the Jews, Moses was a Palestinian, Noah was a Muslim and even Adam and Eve were Muslims. The Jews do not claim Adam, Eve or Noah as being Jews as they predate Avram who was the first Jew at the point that Hashem changed his name to Avraham. But these people who just barely predate Muhammad, only if you use the formation of the universe as your timeclock, they claim were Muslims because they knew the Quran before Muhammad presumably transcribed it from his visions, dreams, meeting the angel Gabriel. So, Yasser Arafat, an Egyptian citizen raised in Cairo was the first Palestinian Arab who was trained for the position in Moscow. Can it get any more convoluted? Oh, it can, as the first act was to co-opt the name Palestinian in order to appropriate the history of the Jewish people who had lived in what was now Israel, and some resided in areas which came under Jordanian rule and were evicted from their homes and most of their possession stolen making a few thousand additional refugees for Israel to absorb from the Arab world, for over two millennia and a few for over three millennia. The original claim made by the PLO was that the parts of Judea and Samaria under Jordanian control and Gaza under Egyptian control, both from 1948 until June of 1967 and the Six Day War, were legal Jordanian and Egyptian lands and the PLO was going to liberate the rest of the lands between the River and the Sea, all of Israel, and then divide it between Jordan and Egypt. The PLO, the terror group revamped into a political entity called the Palestinian Authority (PA), originally was targeting Israel to make all of it ruled by Muslims, preferably Arab, and free the land of the Jewish contamination. The Six Day War of early June 1967 resulted with Israel in possession of all of Judea and Samaria having liberated them from Jordan, Gaza liberated from the Egyptians, the Sinai Peninsula which Egypt lost in the war and the Golan Heights which Syria had lost in the war. As Egypt initiated the war and Syria massed troops also threatening Israel with destruction, Israel could have retained all the lands gained against these nations. Jordan joined the war soon after its inception believing the Syrian and Egyptian media reporting the two nations closing on Tel Aviv from both sides and the King of Jordan was not going to be left out of claiming the lands after the Jews were defeated. The Israelis attempted to dissuade the King of Jordan which he mistook for their begging for Jordan not enter the war as begging Jordan not to add to the apparent humiliation of the Israelis as only one who is weak dissuades their enemies from attacking, as the strong invite conflicts they know they will win. This meant that Israel has a double claim to the parts of Judea and Samaria held by Jordan, the fact that they are part of the lands intended for the Jewish state and they were retaken in a defensive war. Israel reached peace agreements from Egypt who relented any claims to Gaza and Jordan who relented any claims to lands west of the Jordan River. Syria and Israel have an armistice agreement while technically remaining at war and Syria is currently too busy fighting Syria to worry about Israel. Israel annexed the Golan Heights under the United Nations Security Council Resolution 242 which was carefully argued over the wording of the resolution making sure certain allowances were available to Israel as the aggrieved party in the Six Day War. The two main guarantees, promises, were that Israel should have defensible borders and was obliged to return land, not the land, all the land or any reference which might imply that Israel had to return all the lands. The Golan Heights was one of the regions that Israel was assumed to annex as it is a defensible area giving whichever side holds them a great advantage by overlooking the lands below, be they in Israel or Syria. Some of those who argued for terms which would be more liberal and favoring Israel expected that Israel would retain the regions on their side of the central mountains including at least half of the passes and the surrounding mountains. 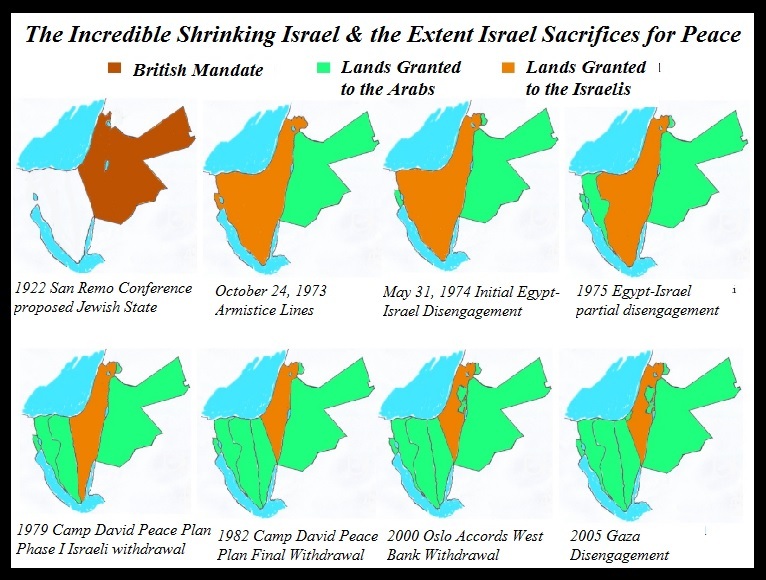 Israel actually returned the entirety of the Sinai in stages (see maps below). The final border Israel was expected to retain was along the Jordan River, the region which the PA is attempting to force Israel to surrender for the formation of Palestine. The longer the so-called peace process continues and terrorist attacks continue to increase, the more likely it is that Israel will annex all the lands west of the Jordan River and allow the Arabs residing under the PA the choice of living under Israeli rule or taking a one-time offer to relocate outside of Israel and promise never to return. There will be those who take the former except they will have no intention of living under Israeli rule or Israeli laws and will continue their terror war against Israel. These individuals will be deported and told if they return, they will face either execution or life in prison. We know the world will howl and wail lamenting the pain and suffering of the poor, wretched Palestinian Arabs deprived of their dignity. That is what they are doing now, so that will not have changed one iota. How did we get to this state of affairs? Well, all of the problems stem from one central theme, the Arab refusal to recognize or allow a Jewish state at all. This was why they attacked at dawn of May 15, 1948, mere hours after Israel declared her independence. They had been offered half the lands west of the Jordan River but preferred to destroy the Zionist Entity and kill every accursed Jew they found. They did not succeed but did take some valuable lands, especially those parts of Judea and Samaria which Jordan occupied. Then again, they believed that they were ready and able to destroy Israel in June of 1967. They lost this time and now Israel held the Sinai Peninsula, the Golan Heights and had liberated those lands of Gaza, Judea and Samaria. Israel returned the Sinai Peninsula, and area several times the size of Israel and containing oil. Israel left their oil platforms and refinery in the Sinai for the Egyptians benefit. Israel, as we stated, annexed the Golan Heights and has stated intention of bringing regions of Area C, all of which under Oslo is solely Israeli land, under Israeli civil law as preparation for annexation. 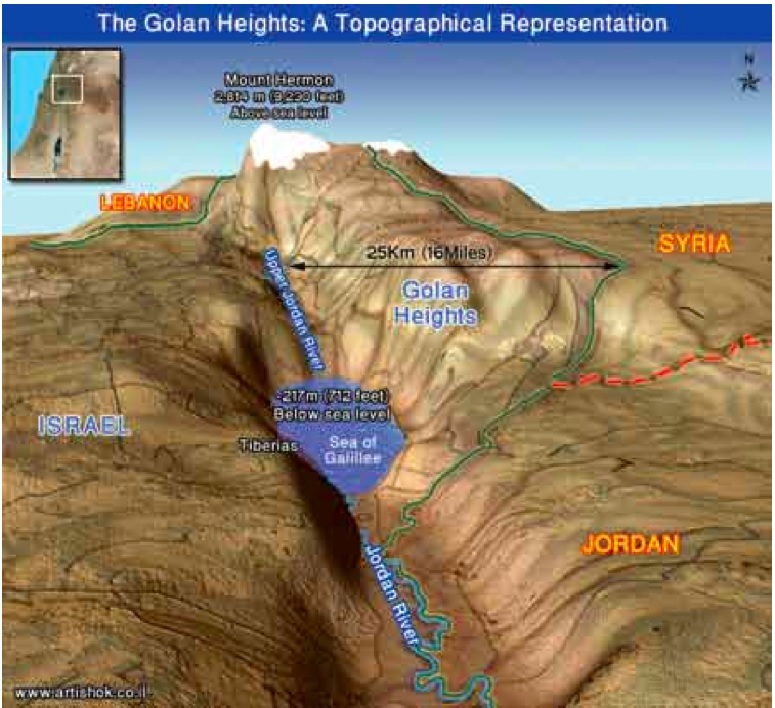 The Golan Heights are a military necessity which becomes obvious when looking at the relief map below. Israel has annexed eastern Jerusalem making the city whole once more and granted voting rights in Jerusalem elections though not in Israeli national elections. According to all the relevant applicable treaties, Israel is to provide religious, civil, economic, social and other rights but is not required to give political rights to any Arabs and other non-Jews living within Israel. Before you start screaming Apartheid, listen for one sentence; Israel granted voting rights and gave full citizenship to all who were residing within her boundaries upon the end of the 1948-9 wars with her neighboring nations of Syria, Jordan, Lebanon, Iraq, Egypt and Saudi Arabia. That included the Arabs, the Druze, the Bedouins and numerous other minorities. When Israel took in approximately three-hundred Vietnamese Boat People, she offered them full citizenship if they desired such. Now for the main argument for Israel retaining all the lands west of the Jordan River, something sort-of made obvious by the above picture as well, but there is another picture which tells the story even better below. The Jordan River is not the most difficult river to cross even if there were no bridges. It is not the river, per sé, but the deep valley and the surrounding cliffs which make both sides great defensive positions and any attempt at crossing places one’s forces in peril. Were Israel to allow a twenty-second Arab state to be formed, as envisioned by far too much of the world, on all the lands illegally occupied by Jordan up to 1967, then there would be no reasonable expectation that such would lead to peace. The Europeans love to claim that such a state would not be permitted a military and would only have police. These are the same Europeans who guaranteed that they would prevent any arms from crossing into Gaza from the Sinai and within the first week abandoned their posts returning to their Tel Aviv hotel rooms only leaving them to head to Ben Gurion International Airport to fly home. After that and while Egypt was ruled by President Morsi, arms poured across that border. Please do not hold us to relying on European promises any time in the near future. Such a state would be armed with whatever the Arab world and/or Iran desired to gift to them. This would include heavy weapons and possibly tanks and aircraft. Within a year that nation we assume would be named Palestine would be bristling with weapons just egging for a fight. We will make an even easier to understand argument against forcing Israel back to the Green Line, the 1949 Armistice Line which the Arab League insisted was never ever to become a border. Now they are the cheerleaders for the Green Line as the border for their new Arab nation. They will still insist that it is not a border for Israel as that would give Israel borders all the way around making it a state, and the Arab claim is that there can be no Jewish state because Allah never allowed for such an entity. Allah cursed the Jews to live as people without a country, strangers in every land, to be cursed and degraded as one’s whims dictate and every other form of disgrace was to be heaped upon the Jews wherever they were to be found. But Jews ruling themselves was a complete impossibility as the Arabs did not believe the Jews had such higher functions of intelligence necessary to rule. Jews were supposed to rely on the good graces of others and accept whatever treatment was dished out as they deserved whatever they got. So, the Green Line is not the end of the conflict, just another stage in destroying Israel in stages. Taking back the Sinai was a stage. Wresting Gaza was another stage which did not go according to plan as Hamas took over in a coup and thus separated Gaza from PA rule. But Arabs rule Gaza and that will have to do for their side for now. Their next aim is to get as close as possible in regaining the lands Jordan lost, the lands Jordan illegally occupied but now that illegal occupation is their argument that the land must belong to Arabs as Israel did not rule over these lands ever. That is not entirely true as Israel ruled over the lands west of the Jordan River for at least twelve hours before the Arab invasion. But they want the Green Line as that includes all of the Judean Hills, the high ground in the above cutaway view. The reality of the situation such an agreement would bring is explained by simply stating that one can see central Tel Aviv, the Mediterranean coastline, Netanya, Herzliya and over three-quarters of Israeli infrastructure, population as well as Dimona, the Haifa nuclear electric plants and so much more. This allows for the terrorists being able to use rockets with no guidance systems as they can adjust their targeting by line-of-sight. 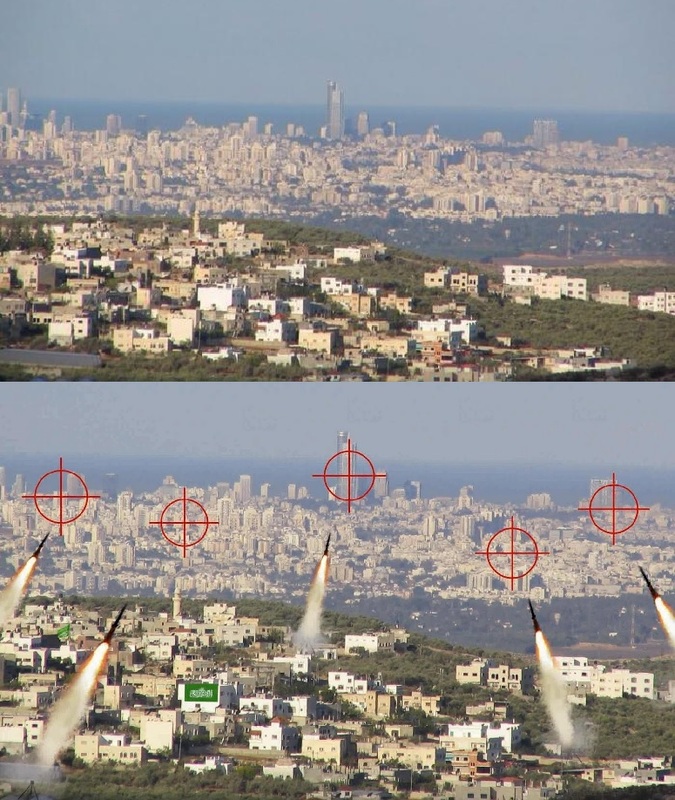 When you can watch your first rocket fly, you adjust and fire again and watch and adjust until either you hit your target or the Israelis target you. An idea of what it would look like before such an agreement and after the world forces Israel to give the land to the PA and the terrorists would see the bottom picture. They say a picture is worth a thousand words, well, this one is probably proof. The picture was taken from the Judean Hills overlooking the Central Plains of Israel. It was taken from land which would be gifted to the Arabs were the Europeans and United Nations, amongst others, to get their way. There has already started claims that the entirety of the Negev belongs to the Bedouins. Only in Israel do Bedouins, who elsewhere are considered landless nomads, become claimants to lands. But that would be the next stage of chopping up Israel until it is completely unable to defend herself. Mahmoud Abbas has regularly claimed Tel Aviv, Haifa, Akko, Ashkelon, Ashdod and Tiberius which are all within the Green Line and recognized by the United Nations and even the European Union as properly parts of Israel. Abbas has made clear that any size Jewish State is completely unacceptable. Iran has also stated their intent to destroy Israel and eradicate the Jews worldwide. Most Arab leaders have, when referencing who they are currently fighting or about to invade, always included Israel when making threats to places which have nothing to do with Israel. Whenever Iran or Arab nations threaten the United States, they just have to add a chant of death to Israel just for good measure. We also know that Jerusalem is on their list as the number one city they desire to conquer simply because that is exactly what making a city the third holiest site in Islam means. Before Jerusalem, that position was held by Damascus, Constantinople, Rome, Paris, London, Vienna and many other cities which have come within Islamic sights. The main problem is that the Western World has almost no understanding of the Islamic religion, rigors, aims, restrictions, demands and especially its eventual claims of how they will perfect the world. Just give all a starting point, the eventual end all of Islam is their ruling the world, Islam being the only religion on earth and those who are not yet converted given a simple choice of conversion or death, often by beheading. Islam is not the religion of peace as their definition of peace is their ruling and only Muslims having rights. Find a copy of the Quran with the Hadiths in chronological order and each time you find one entry which contradicts a former entry, the later entry supersedes the former. The easy answer is that it is because Israel has far more nations which have developed a bifurcated set of relations with Israel; one condemnatory taking the Arabist view that Israel causes conflict as they attempt to incorporate more land and the other taking any and all the advances which the world is benefiting from as Israel writes new Apps, compiles programs upon which computers are run and for protecting computer systems from malware and attack as well as discoveries and inventions too numerous to list. Israel and her people have no problem with the world gaining from her efforts in more areas than people realize. Without Israeli inventions and programs, the cellphone you rely upon so heavily might not even exist and if it did, it would be bulkier and more problematic. Almost all malware and virus protection software were developed in Israel. Add to this list drip irrigation, hybrid plants which grow in arid climates, stents used to open arteries which also deliver medicine and anti-clogging drugs for months after their insertion, procedures for treating heart problems in infants, and being one of the first nations to arrive providing assistance after a disaster. We could add much more to this list making an article in and of itself, but those interested can find most of this information with a basic search. But in this article, we are more interested in the reasons nations utilize to denigrate, belittle and attack Israel and the reality which the world appears to have completely forgotten. The best place to start is with the period towards the end of World War I and the ensuing decade after peace was established. To believe that anti-Israel screed, one does need to ignore this period as well as numerous other promises made to the Zionist Jews. The initial document which eventually established Israel was the Balfour Declaration of 1917. This was subsequently followed by the San Remo Conference which was officially published on April 25, 1920. From this conference there were numerous treaties including but not limited to the Treaty of Sèvres, the Treaty of Lausanne and the Treaty of Versailles which set up the original rules and powers of the League of Nations. The results from all these many treaties, conferences and other legal papers became the Mandate System for control of the various regions of the defeated Ottoman Empire and rearranged, to include forming new nations for indigenous peoples in the Balkans and other regions which had been ruled by the Austro-Hungarian Empire and Greater Germany. This already puts to a lie the claims made that it was only the Ottoman Empire which was made into several countries by the Europeans after World War I. 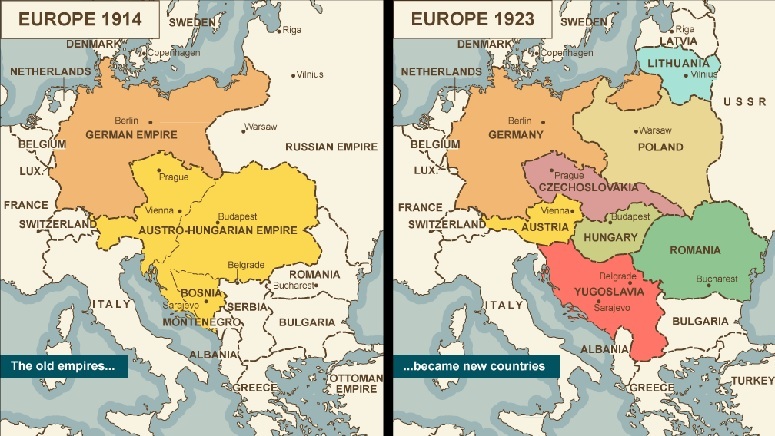 The map of Eastern Europe was also drastically altered in much the same fashion as was the Ottoman Empire as shown in the two maps below which compare the before the war and after the war carving of Eastern Europe into several new nations for indigenous peoples. So, the truth was that the two empires which lost along with the Ottoman Empire were also chopped up creating Poland, Yugoslavia, Czechoslovakia, an enlarged Romania and a far smaller and separate Austria and Hungary with Germany also forgiving large sections of lands. This is easily found as it is basic history regarding the ending of The War to End All Wars, also renamed later as World War I (as we had another one soon thereafter). But the propaganda being sold is that only the Ottoman Empire, and specifically the poor Arabs, were cheated out of their rightful Caliphate. They decry that after the war in which the Ottoman Turks were roundly defeated with numerous Arabs assisting in that struggle that they were not given all the Ottoman lands in one chunk such that they would have their empire back despite losing. Basically, their complaint is that they did not get a do over after losing the war because they cannot lose any war as the Quran states that they will always be the victors, thus they have to get everything back as it was before they lost. This should sound familiar to some people out there as it is the same argument they are using against Israel. The Arabs started the wars in 1948, 1956, 1967, and 1973. After their loss in 1956 Suez War, Egypt demanded Israel return the Sinai Peninsula. As both Russia and the United States insisted Israel return the Suez Canal as Egypt has promised to never attack Israel or close the Straits of Tiran to Israeli shipping (this cuts off Israel’s only port leading to Asia and as such its closure is a casus belli as an act of war). When Egypt again closed the Straights of Tiran to Israeli shipping, itself an act of war, and, along with their ally Syria, massed troops and armor along the Negev-Sinai border and along the Golan Heights overlooking the Galilee with Gamal Abdel Nasser threatening to utterly destroy Israel in 1967, once the dust settled Israel had taken the Sinai again as well as the Golan Heights from Syria, and as Jordan also joined the war on Israel, Israel liberated Judea and Samaria, the Shomron which Jordan calls the West Bank. Notice that when it came to the lands which Jordan had occupied for nineteen years illegally with only Pakistan and Great Britain recognizing their annexation of lands which were promised to Israel, we rightfully refer to that as liberating these lands as that is actually the reality. For this we refer back to all the events after World War I when the lands for Israel were set aside. After the war of 1973 Israel was wrestled back across the Suez Canal as threats from the United States Department of State of dire consequences should Israel not retreat from their advances on Cairo and Alexandria in Egypt and Damascus in Syria back to the lines of the 1967 armistice such that the Arab nations did not lose additional territories to Israel including both national capital cities. The original agreed upon division of the British Mandate lands was so simple that it is hard to understand why the world cannot grasp exactly what was laid out. The League of Nations approved it unanimously, the Zionist Congress agree to the plan, and the British claimed that they would back this division with the British Crown. The division of the British Mandate made two states for two peoples before that was even a buzz phrase most often deployed against Israel when it should be the Israeli defense against the packages of lies she must contend with. There would be a Jewish state referenced as Palestine (at this time a Palestinian was a Jew residing in the holy lands and Arabs were called, well, Arabs) and an Arab state which became Jordan and the Hashemite tribe was granted to rule so as to allow the British to keep their promise to grant the sons of King Faisal lands over which to rule (his other son became the King of Iraq). 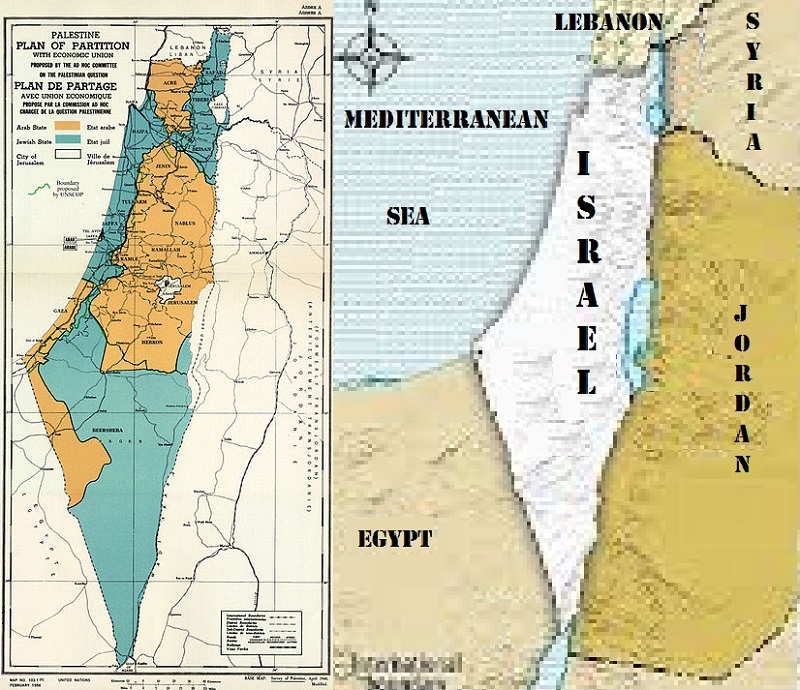 The lands were divided fairly, or at least that is what the Arab League agreed upon at the time of the decision, with the Arabs receiving 78% of the lands, those which lie east of the Jordan River and the Jews got 22% of the lands, those which lie west of the Jordan River. This is really crucial as this is exactly what international law and any decision from the World Court, the Court of the Hague, the International Court of Justice, International Criminal Court and presumably at the United Nations which is bound to enforce the Mandate System according to Article 80 of their charter. 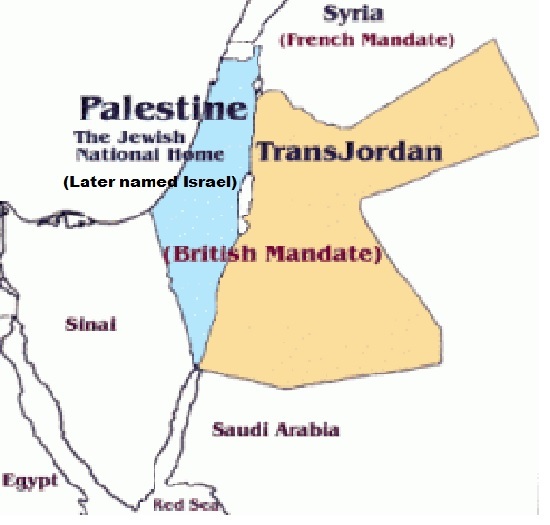 Just because it is so easy, we figured we would include a map below which depicts the British division of their Mandate lands using the Jordan River as the border between the two nations. These are the pertinent facts about Israel and her intended and internationally agreed upon borders. Even the Arab League originally signed on to this division made by the British. Their agreement might have been due to the Jews getting the short end of the stick or the tiniest of the lands except for the French nation which was supposed to be Christian, that being Lebanon which is currently all but ruled by the Iranian terror arm, Hezballah. With all the preliminaries and history out of the way, please allow us to move to recent events since Israeli independence was announced on May 15, 1948 (actually the evening of the 14th as Jewish days begin at sundown thus the declaration of independence bringing the state of Israel officially into the world was made on the evening of May 14 and officially regarded by the rest of the world to have been the 15th, confused yet? ), and then the violence began. The first and biggest lie is that Israel has never lost a war with the Arabs. Israel could be said to not have won but have survived the war which started the morning of May 15, 1948, the first morning that Israel came into existence. Six Arab armies invaded Israel that morning. They were Saudi Arabia, Egypt, Lebanon, Syria, Jordan and Iraq (map of their invasion routes included below). The United Nations had made an attempt to prevent the war by offering a solution which would have divided Israel into two nations, another Arab nation within what had been the British Mandate and a Jewish nation. Most of the Jewish lands were in the Negev Desert (see lower map with patrician on left and original intent on the right). The Arab League refused the compromise as they had their own plan to deal with the Jewish State, an invasion which was intended to wipe the Jewish state from the map of the world. The invasion was described by Azzam Pasha, Secretary-General of the Arab League at that time who stated, “It will be a war of annihilation. It will be a momentous massacre in history that will be talked about like the massacres of the Mongols or the Crusades.” When the Arab League refused the United Nations General Assembly suggested compromise, that nullified that proposed solution permanently. That meant that Israel on the morning of May 15, 1948, had as her eastern border the Jordan River and her southern border at the line between the Sinai Peninsula and the Negev Desert, this was an approximation of the River of Egypt also called the Wadi of Egypt. After this war, Israel had lost Gaza to Egypt and most of Judea and Samaria to Jordan. When you lose lands in a war, that is not a victory. But because Israel staved off utter destruction, the claim is Israel won because she still existed. Had the war played out as the Arabs expected it would, then there would be no Israel and a second Holocaust would have come to pass and the prediction of Azzam Pasha would have also come to pass. The main item to remember is that Gaza and what would be renamed West Bank were lands lost by Israel from an invasion by the Arab world leaving these lands as illegally occupied. This was the real and only occupation. After the 1948 war, Jordan claimed to have annexed the parts of Judea and Samaria they had taken and, more importantly, extended citizenship to the majority of the Arabs residing in these lands. Jordan also forcibly relocated tens of thousands of her own citizens into these lands so as to prevent their being liberated by or returned to Israel. Egypt simply extended military control and rule over Gaza. In 1956 was the Suez Canal crisis when Nasser nationalized the Suez Canal and cut off its use to European nations while closing the Straights of Tiran to Israeli shipping. This causes France, Britain and Israel to ally setting a time which if there were no resolution, then the three nations were to attack Egypt. That hour came and Israel did what she was assigned, take the Sinai and the eastern side of the Suez Canal. The British and the French opened up negotiations with Egypt. Egypt set the return of the Sinai as their demand before they would agree to open up the Suez Canal to all shipping. Well, you can guess what came next, universal demands that Israel, in order for there to be peace, must return the Sinai Peninsula. Another case of an Arab loss of lands and their main concern is the return of those lands such that they get a do over. Then came the 1967 Six Day War and Israel once again took the Sinai from Egypt and took control of the Golan Heights from Syria and liberated the West Bank returning the rest of Judea and Samaria back to Israel after nineteen years of its Jordanian occupation. Then in 1973 the Syrian and Egyptians attempted once more to erase Israel from the map. This time Israel initially was losing and things appeared desperate. Eventually the Israelis turned the tide and by the time the world reacted, Israeli troops were almost at Damascus in Syria and well on their way to Cairo and Alexandria in Egypt. Can you guess what the world demanded and was all upset appearing on the verge of busting blood vessels. That’s correct, they demanded that Israel return to the lines left from the Six Day War and return every inch of Arab lands Israel stood to gain. Israel eventually returned the Sinai to Egypt in exchange for peace and Egypt surrendered any claims to Gaza. When Israel reached an agreement with Jordan, Jordan released her illegal claims to the West Bank and they returned to being Judea and Samaria. There is one very large item which needs to be mentioned. Nowhere in all these wars and the ongoing conflict was there ever any nation called Palestine and the one main reference to Palestine was it being the Jewish State. In 1964 the Arab League in conjunction with the KGB initiated the greatest hoax in all of history, we think even greater than the Trojan Horse, and founded the PLO, the Palestinian Liberation Organization, a terrorist group which would bring such things into the world as plane hijacking, suicide bombing and almost every other terrorist act in use today. The concept was for the Arabs to now claim that they are the Palestinians and use that to claim all of Jewish history since the Romans renamed the region after the second (or third depending on your sources) Jewish uprising against Rome. The Palestinian Arabs have also claimed to have been the Canaanites, to have resided in the region for nine-thousand years, have invented the Palestinian-Canaanite Language including writing five-thousand years ago (a good two thousand years before cuneiform, the first written language according to anthropologists) and that the Jews invaded Palestine which was entirely Arab with not a Jew residing there before their May 1948 Jewish invasion. There are so many holes in each of these and numerous other arguments made by the Palestinian Arabs but the world just gobbles them up and claims they are delicious, do you have anything else we can blame on Israel, the Jewish state. There are those who ask why Israel does not fight back against the multi-billion dollar a year Arab propaganda war. The answer is easy, Israel spends an inordinate amount of her budget on defensive weapons such as the Iron Dome, offensive weaponry such as the Merkava tank, and training their service members in the various arms of the IDF. Israel does not have oil and is not being funded by any of the oil producing states in the region, imagine that. Israel has and does attempt to discredit the lies but apparently the media does not care as they have taken the Palestinian Arab side in this disagreement. The United Nations only knows one item, Israel is to blame for any and everything. The Human Rights Commission passes a resolution condemning Israel at the start of every meeting. The General Assembly celebrated the rights and future of the Palestinian Arabs several times each year. They seldom have a nice word for Israel. There was that one time where the United Nations named the IDF emergency response teams as the best in the world, imagine that. The reality is that Israel’s eastern border is the Jordan River, period. Her borders are set by international conferences, treaties and agreements. This will remain her border until and unless Israel signs an agreement where her borders are altered. This has been true even when Jordan held lands west of the Jordan River as that was the illegal occupation as was Egypt holding Gaza. There are some who believe that Israel signed off on Gaza, but that agreement was that this was to be a trial to see if the Palestinian Authority was capable of ruling itself. The obvious answer was a resounding no. Israel could enter Gaza and force out every person whether terrorist or civilian and it would technically be legal. Yes, we realize it would never be allowed to stand and the world would then demand Israel make a nation out of Gaza with Hamas terrorists as their governance. The same applies to the regions currently under semiautonomous rule of the Palestinian Authority. The Arabs residing in Gaza and the Shomron are not Israeli citizens as they were on the other side of the armistice lines which took effect in 1949. Technically, these Arabs became citizens of whatever nation they were in when the war ended, be it Egypt, Jordan, Syria or Lebanon. The original Arab so-called refugees were less than seven-hundred-thousand, measurably less than the over eight-hundred-thousand Jewish refugees thrown out by the Arab world across the Middle East and Northern Africa. This should have been made into a swapping of citizens, Jews went to Israel and Arabs to the Arab world. This is what occurred with India and Pakistan, Germany and Poland, Germany and Czechoslovakia, Turkey and Greece in Cyprus and between numerous nations after wars or the founding of a new state for a displaced group such as was the case with Pakistan where they hoped was to separate Muslims, Hindus and Buddhists so as to lessen tensions. But these unfortunate Arabs have been locked away in camps for generations solely to be used as a weapon with which to threaten Israel. Everyone knows that these Arabs will never be resettled in Israel as that would be suicidal for Israel (which is why so many are behind this idea). The only legal and proper means of settling the Arab Israeli conflict is to apply the assigned borders to Israel and relocate those Arabs who do not wish to live under Jewish rule. Those who remain will be treated as a legal foreign alien who could be granted the right to elect local leaders but would not have full citizen style rights which means they could not vote in Israeli elections and numerous other details. They would not be permitted an armed police force. Their law enforcement would necessarily be provided by Israel and according to international law, this would be required to be a military enforced law. It would even be wise to provide those Arabs who decide to leave not only fair market price for their properties, but a relocation stipend making their relocation go easier. The one thing which is becoming obvious, this situation cannot be permitted to continue to exist. Israel needs to set an ultimatum that either they accept an offer cobbled together by the Knesset in conjunction with whatever foreign powers would need be included, and that if refused, then negotiations have failed and any act of terrorism will be responded to with extreme responses and the entire family of a terrorist will be forced to leave Israel permanently. Their return would be considered a capital offence which could see them receiving a life sentence or even the death penalty. Repeated attempts to return or any future terrorist act by a deported family member would require either aforementioned sentencing. Yes, that is unfriendly, but the terrorism against Israelis is not exactly friendly even if you wish Israel would disappear, a stance being taken by even some political representatives in Europe and the Americas. Israel should not have to live with such hatred sitting within her borders. Nations have rights on what they can do with uninvited individuals and it is past time for Israel to ignore the Europeans and their constant whining about how evil Israel is and just do that which is necessary. No other nation would have tolerated such within their borders for one tenth of the time. Proof, look at how Britain handled the IRA, France the Yellow Vests, China handled Tienanmen Square or any number of uprisings or extended protests and you will see that Israel has put up with enough and time has come to bring these problems to the point they will eventually reach, the point where Israelis have had more than they can take and demand action from the government, and if they do not get their desired results, then expect the next government to understand the ultimatum the people are making. There will be an end and it will come suddenly probably in response to a terror wave or prolonged rocket firing into Israel. This end will be applied to Hamas, Islamic Jihad, PLO, Palestinian Authority, Hezballah and any other entity wishing to destroy Israel or murder all the Jews on the planet. We hope the Arabs see it coming and leave peaceably, but for some reason we just cannot see such ever evolving from the situation. That is so very unfortunate as there are many Arab Palestinians who would rather just live in peace and under honest leadership and not kleptomaniacs such as they have now. The problem has only gotten worse because of the concerted effort to use the schools, sports, entertainment and everything they can twist to produce new generations who hate Israel and Jews more than the previous generation, and they are succeeding. This will force the issue all the faster, and it will not be good for anyone when the end comes. There exist certain exacting criteria which have become the watchwords demanded of any peace plan if its presenters expect general support. Without these particulars incorporated into your plan, then you are doomed to fail finding yourself left out in the cold space of rejection. The Arabs will laugh in your face, then when you pivot, you will receive a full and proper scolding, all as openers for putting their stamp of approval upon your plan, but not until they are permitted to amend your plan bringing it in line with their experts. Who, you might ask, are the experts and how did they become such experts? Well, that is not as difficult an answer as you may think. An expert is anyone who has published works which insist on a solution where the lands gained (liberated from illegal Jordanian rule) in the Six Day War are returned to their rightful owners, the Palestinians. 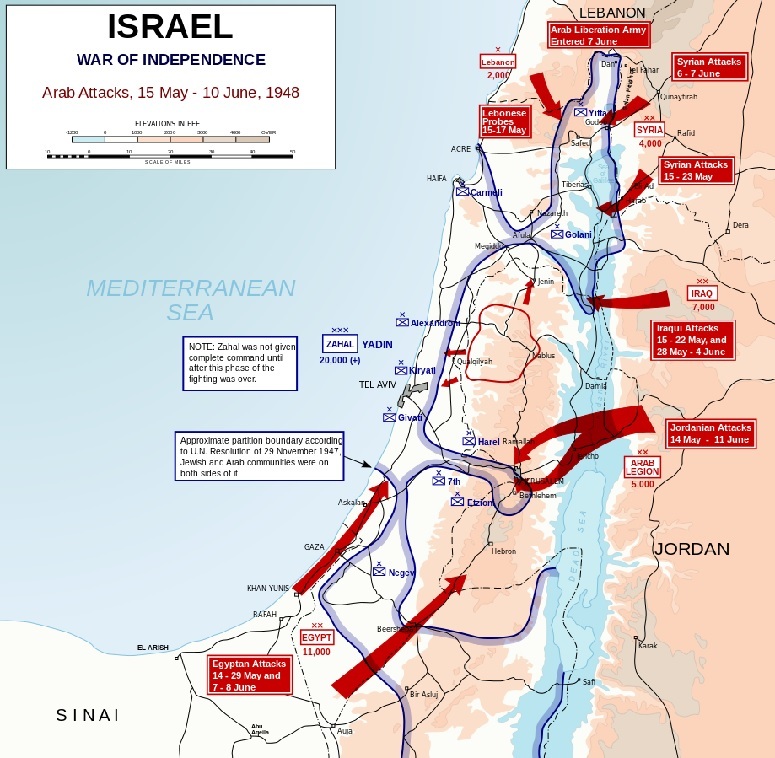 As an expert, you are completely convinced and aware that the invented convention that the Palestinians have this country called Palestine and the Jews made an amphibious assault taking the beaches in May of 1948 and from that established beachfront, the Jews expanded threatening to conquer the entirety of the Arab World. Fortunately, the Arab armies managed to stop the Jews at what is called the Green Line, thus at least this should be the border. Jerusalem must also be split in half as that was the way it was supposed to be. As long as your scholarly opinion is in agreement with the Arab and European talking points, then praises will be heaped upon you, you will receive invitations to address scholarly conventions with others who believe as do you. Your plan is safe as long as it meets with “the requirements” which everyone who is anyone should be familiar with the points. Vary from the well-worn path which all previous failed plans traveled before yours, then you must be a racist, a radical, you are an instigator who is not serious about reaching a solution. These are the rules for all proposed plans for settling the Arab-Israeli Conflict. Oh, and one last word to the wise, we who decide all do not use the dated terminology of Arab-Israeli Conflict, the newly discovered term which we insist has always been how the problem has been framed, it is now called the Israeli-Palestinian Conflict. Get with the program if you ever expect to address the Human Rights Council or even the big time and address the General Assembly. This is the atmosphere into which President Trump will be placing his “Deal of the Century” aiming to settle the problem upon which, according to those experts we referenced earlier, any solution must meet with their approval. Further, according to these experts, there must be another nation for the Arabs, oh, sorry, we stand corrected, the Palestinians must receive their rightful state no matter how much the Jews whine about their needs for a secure and defensible set of borders. We experts realize that is just code wording for establishing a “Greater Israel” over half of the Middle East. All of we experts are aware of the deep hidden desire the Jews have to rule over the world and control all the governments. That is why it will be so important that those who have been gifted with recognizable enlightened knowledge be permitted to dictate a proper solution to this conflict respecting the dignity and historical perspectives. We have the credentials given us by our governments who rely upon us to set the height of the bar and the parameters any plan must meet if anything is expected to result from its presentation. We are aware that this set of parameters has been tried repeatedly with the same results, no peace and further increases of terrorism. But trust us, this time it will work if only Israel would allow additional lands to be turned over to the needed Arab entity. Let us look at the Israeli demands which are largely directly attributable to her security and ability to defend her people. The main pieces to any settlement have changed since the Oslo Accords, both I and II, are dead and buried. Mahmoud Abbas has declared this repeatedly, and for a change he is correct. Israel insists on retaining the Golan Heights and the Jordan River Valley (it more resembles a steep sided gorge) and the western cliffs overlooking the river. These are the strategically necessary positions in order to both stop a land assault from the east as well as serving to prevent any Arab entity from importing heavy weaponry. 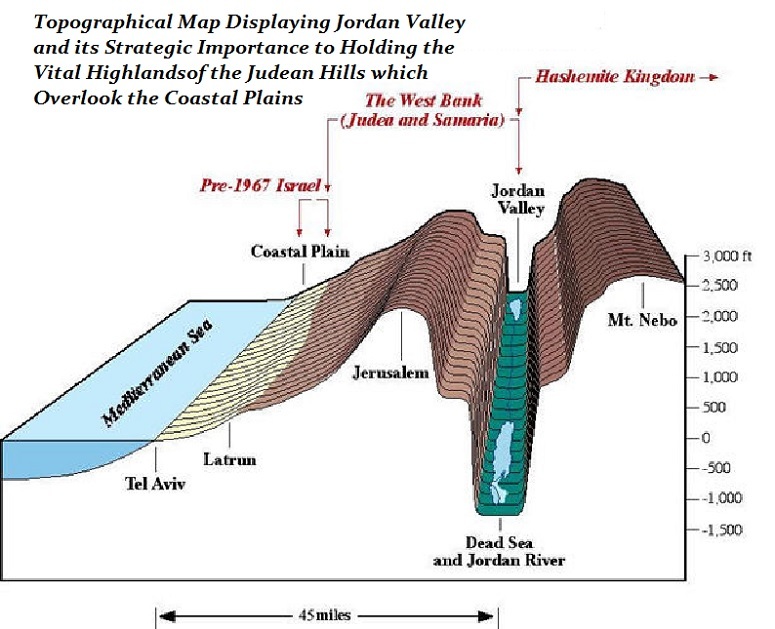 The reasons for the strategic land positions become very evident on the map below which shows the Golan Heights and the Jordan River Valley in topographic relief. Another reason for retaining the overlooking cliffs is for eastward facing radar for early warning of any approaching aircraft. There was a period immediately after the Oslo Accords when Israel offered over ninety percent of the former West Bank (the Shomron or Judea and Samaria) and proffered land swaps in exchange for the main settlement blocks and was also offering the return of eastern Jerusalem. These offers were put forward by both of the left-wing governments, one headed by Ehud Barak and the other by Ehud Olmert. These offers were co-authored by President Clinton assisting Ehud Barak and by George W. Bush with Ehud Olmert. President Clinton had even twisted Barak’s arm until he agreed to every demand by Yasser Arafat. Arafat then refused his own terms and returned via Jordan and finished implementing his plans for the Second Intifada. Even the most minimal demands, actually more like requests, by Israel are unacceptable to the Arab side. So, what exactly is the Arab side of the argument. What exactly will they accept in order to make peace? Unfortunately, their demands are spoken of only in Arabic, but thanks to MEMRI, Palestinian Media Watch, Honest Reporting, CAMERA, Stand With Us as well as blogs such as ourselves and Chaim Report, Elder of Ziyon and many other worthy efforts, these speeches have been translated and, except for the United States State Department, anyone can go to these locations and find what Abbas and the rest of the terrorist entities both in Gaza and in Judea and Samaria have been saying to their own people. The first realization one reaches is that what they say in Arabic contradicts almost everything said in English. Odd as this concept may seem, but this form of lying to the infidel in order to advance the conquests, interests, positions or simply to obscure the truth of Islam is a religious obligation known as Taqiyya. There is a saying that the way to know when an Arab leader is using Taqiyya is very simple, if it is in English, it is Taqiyya and if it is in Arabic, then the odds drop to around fifty percent depending largely if the speaker will gain from what they are communicating. But when they are using English and placing it for Western consumption, when stating such things as Islam is the religion of peace, terrorism is against Islamic principles and other such statements, it is most definitely Taqiyya so you would be closer to reality by negating everything presented which one finds pleasing to hear. These are stories told to lull the West, the enemy, into a false sense of calm and security all the while undermining everything they are able, and infiltrating the rest. There are exceptions such as when emotions get the better of them and the truth tumbles out. The most obvious recent example has been Mahmoud Abbas consistently stating that President Trump and his Deal of the Century are going to be refused because President Trump has proven by moving the American Embassy to the Capital city of Israel, Jerusalem, that he is biased and serves only Israel. This was simply telling the truth that any peace deal, it does not matter whose it is, as they refused President Obama’s overtures, is dead on arrival if anywhere within the peace plan the Jews are permitted self-rule. There is one point which the Arab Palestinians insist upon in any peace agreement, that they rule all the lands from the Jordan River to the Mediterranean Sea and that the Jews are removed completely from these Islamic Waqf or they will remove them in their fashion. Abbas has repeatedly stated, nay, insisted that every millimeter of lands under Palestinian Arab rule must be free of Jews. He has stated that he does not care where they go, just that they go. So, if Abbas and his Hamas, Islamic Jihad and whatever other terror groups currently are nested in Gaza or Judea and Samaria are ever granted their state of Palestine from the river to the sea (Jordan River to the Mediterranean Sea), there will be no room for the Jews and Israel will have been destroyed. These are the demands of the Arabs, that the Jews be returned to their proper place of a people without a country chased from one nation to the next cursed by Allah. Anything short of a complete victory and the utter decimation of Israel leaving the Jews at the tender mercies of the world is unacceptable to the Arabs and they will simply walk away from any negotiations which grant them less and claim Israel is not serious about making peace. The one item which is in Israel’s favor is that according to international law derived from the San Remo Conference, the League of Nations unanimous decision for the establishing of the Jewish State and the Mandate System set up for that expressed purpose, all of which is further backed by the United Nations Charter Article 80 which placed the full enforcement of the United Nations towards realizing the results spelled out in the Mandate System, mean that unless Israel signs a treaty forgoing her ownership of any of the lands west of the Jordan River, the lands are legally all belonging to Israel. Currently, Gaza is a semi-autonomous region ruled by Hamas and parts of Judea and Samaria are a semi-autonomous region ruled by the Palestinian Authority. Neither of these governing entities has held elections for over a decade and Mahmoud Abbas is in his fourteenth year of a four-year term. Whenever it appears that there will be an agreement between Hamas and the Palestinian Authority, some technicality or misunderstanding always prevents their union and the holding of elections. Every time elections have been scheduled by the Palestinian Authority, some problem or emergency has caused Abbas to cancel the elections. These are the real reasons that the Palestinian Arabs have not voted for a long time and it has nothing to do with Israel. At least Hamas has declared themselves to be a dictatorial ruling power, Abbas claims to be a democracy where elections just never materialize. Mahmoud Abbas knows he would lose any election and that Hamas would be the victor and unless he escapes in time, he would be tried and hanged. But the media refuses to report the reality as they have taken a position critical of the Jewish State and forgiving of all sins towards the Arab entities. The Europeans have worked with great diligence in their attempts to rid the world of the Jewish State starting even before Israel had declared her independence. This is where the Arab refusal to accept Israel ruled by the Jews in any size or configuration has saved Israel almost despite herself. When the United Nations on November 29, 1947, in the United Nations General Assembly adopted Resolution 181 which would have divided the lands west of the Jordan into equal sized states, one Arab and one Jewish; the Jews accepted this terrible idea and were saved because the Arabs refused to permit any Jewish state and had already planned to invade Israel immediately after she declared her independence. This was the war which began on May 15, 1948, and is misnamed the Israeli War of Independence, but we like to give it its real name as described by Azzam Pasha, Secretary-General of the Arab League at that time who stated, “It will be a war of annihilation. It will be a momentous massacre in history that will be talked about like the massacres of the Mongols or the Crusades.” That is what the Arabs expected, a war of annihilation where every Jew and probably others even including some of the Muslims who did not hate the Jews with sufficient fervor. Six Arab armies invaded Israel as described on the map below and somehow, without an actual organized military, Israel survived. Israel lost Gaza to Egypt and parts of Judea and Samaria to Jordan. When the PLO was founded in 1964, three years before the Six Day War, their claim was to destroy the Jewish State and turn the lands where Israel had existed over to Jordan and Egypt. They expressly laid no claim to Gaza or the parts of Judea and Samaria under Jordanian control as they were in Islamic hands and did not require cleansing. After the Six Day War, their claims immediately changed to specify the regions lost by Egypt and Jordan claiming in English that this was all they desired. Still, they have turned down numerous offers which would have given them almost exactly what they claimed to demand and they refused every time. There have been times that a near majority if not a definitive majority of Israelis feared the offer being made to the Palestinian Arabs as they foresaw what would follow. Each time their fears were allayed as Yasser Arafat and then Mahmoud Abbas after him refused every offer. The world knows their only acceptable peace is one where the Jews are destroyed, preferably the world over, but it is easier to blame Israel than officially recognize the truth and work from there. When will the Arab Israeli conflict end? There are two answers. One is after Israel delivers such a blow to the Arab world that they fear for their existence. The other is upon the coming of the Messiah. Until then, every president will try and fail because until a President offers to destroy Israel for the Arab Palestinians so they can have a larger failed state, there will be no solution.